Have you ever wondered if Modern Art is a product of un-intelligible insanity or is intentionally produced to degrade the human spirit so it is left hungry and hopeless. One of the two things that elevates humans is art, the other spiritual beliefs. The painting you see sold for $110 Million. For your consideration, one person offered his opinion on why "Modern Art is Trash". Viewer discretion is advised. Art, as with life itself, has certainly imploded from run-away gimmickry, going back actually to the likes of Andy Warhol, Rauschenberg, Lichtenstein along with other public relations fakers! Personally, artists such as Max Beckmann, Edward Hopper, and Andrew Wyeth represent the best of so-termed "modern art". Although hardly modern any longer, I'm not too crazy about Max Ernst, and even some later Picasso can grate a little. The image above looks strangely like a Bacon, the English painter of the last century, possibly even a James Ensor. The painting you see sold for $110 Million. Don't fancy that hung on my wall, bit nightmarish. Looks like graffiti to me but then I'm not a fan of modern art in general. To be strictly accurate Bacon was Anglo-Irish, born in Dublin to English parents and raised in Ireland. He loved the Irish countryside but apparently in adult life he used to get a panic related asthma attack when he tried to fly back to Ireland for a visit and thus never returned there. That's what he told Lucian Freud's wife anyway. He didn't consider himself to be Irish but his 'Irishness' asserted itself once at a party given by Ian Flemming's wife where Princess Margaret had grabbed the microphone and was singing, very badly and being loudly applauded by the party goers until Bacon booed her off the stage! I don't think any true Englishman would do that, except maybe John Lydon or Sid Vicious! After he died his studio was dismantled and shipped to Ireland where it's now now on view in the Hugh Lane gallery in Dublin. I saw it years ago, though I'm not a Bacon fan at all. I'd gone to see Les Parapluies by Renoir which was on show at that time. A lot of stuff by him turned up in a suitcase stored under a bed in Tangier. Interestingly they belonged to Paul Danquah, the actor who played the sailor in "A taste of honey". Bacon had rented a room from Mr Danquah and his partner many years before and paid the rent in drawings. They'd actually forgotten about this until they were going through their belongings before moving house. The art was worth many millions; as far as I know, they gave it to either the Tate or the National Gallery. With art, you either get it or you don't. There are some great abstract artists from Poland, and the cente for contemporary ar5 at Ujazdowski Castle is very worth a visit. If a child in school would make a horror painting like the one above they would be directed to have a psychiatric exam. With art, you either get it or you don't. I'm afraid I don't. The painting above doesn't move me at all and although it sold for an unbelievable amount of money, I don't think the artist is particularly talented. Not when compared with the Impressionist or Pre-Raphaelite painters for example. I just don't get modern/comtemporary art. The work of 'artists ' such as Damien Hirst and Tracy Emin leaves me cold. Basquiat isn't my favourite artist either; nevertheless it has merit. Something like a De Kooning, or a Georgia O'Keefe is a thing of real beauty - not that art is always meant to be beautiful; sometimes it exists to challenge. Some of the less aesthetic figurative art, by Beksinski or Freud, is not for me. (Possibly) the first abstract non-representative artist, Hilma af Klint is worth a look if you don't know her work. It was ignored for decades and only now is becoming known. There was a long period where people (literally) couldn't give it away; now it's highly valued. Anyone actually watch that quick commentary? The Renaissance took humanity out of the dark ages. Now we have bathroom humour and bathroom art. The Renaissance can lift humanity again. I do know the CIA has had a hand in deliberately influencing certain artworks in the past. I contend the downward push never ended. The insane, bizarre and psychotic get promoted, while the beautiful, transcending and uplifting get thrown by the wayside. Art is 'promoted' on merit. The links refer to the American government promoting the appreciation of American art, something which is a small fraction of the modern art that is exhibited and sold. while the beautiful, transcending and uplifting get thrown by the wayside. That is meaningless. Especially the 'thrown by the wayside' bit.
" Art is 'promoted' on merit. " Grossly incorrect and naive. Also incorrect is to assume that similar degradation models are not adopted elsewhere. Did you watch that 15 minute video mentioned in the first post of the thread? No one here has stated they have yet. It's actually hard to see whjat you're trying to say here. It just looks like you like some forms of art less than other forms. Other people disagree, as the thousands of public galleries around the world that display abstract art prove. Not everyone watches youtube videos; some of us prefer to read. This bit doesn't make any sense. What is written is stated clearly. I can't engage someone who doesn't want to be engaged. Part of the point of this post is encompassed in the brief video, which you refuse to watch because you are busy reading. You'll excuse me if I don't wish to keep you company anymore. If you do decide to watch the video during a reading break, as an artlover you may appreciate the beauty and artisanship of the woman vomiting in different colours or the naked fatman squirting things from his rear, each onto a canvas. Bon apetit. I can't engage someone who doesn't want to be engaged. Or who doesn't agree with your point of view on art (as thousands don't). You seem to be very selective about the examples you choose in the above post, selecting rather extreme and challenging examples to try and prove your point, which isn't relly a point at all, just an expression of your own personal tastes. I'll keep going to galleries thanks; like a long-planned trip to the Guggenheim next month. No one here has stated they have yet. I watched some of it but the sound quality of the voiceover was so irritating I had to stop! The guy makes a fair point but quite honestly art has been manipulated/promoted or disregarded for centuries. If you just take western Europe, there is a pattern. Firstly it was the church who acted as patrons and artists were obliged to produce their works in line with what the church wanted, then Royalty and aristocracy, then the rich merchants of Germany/Holland etc, then the Academic painting tradition where the Academies selected works which were expected to fall within certain perameters. Now having said that, I'm with you in terms of finding nothing of merit in most of the works referenced. I don't object to a painting that is trying to 'speak' to me with some unpleasant message but I object if it's poorly executed and hideous. There are plenty of paintings by Victorian artists that contain thought provoking statements about human suffering for example but which are beautifully and sensitively rendered with great technical merit. 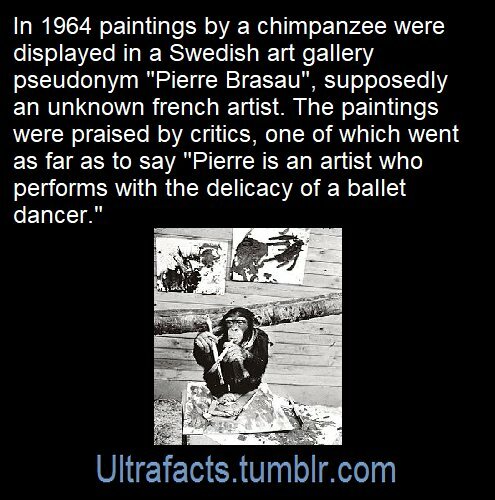 I also don't object to artists like Picasso who can actually draw, but choose to adopt a personal style that they find more expressive. I also like the work of the primitives, untrained artists like the British painter Lowry because such works are honest. I certainly can't see any reason to use human feces to make a statement though. I would say 'the arts' rather than art, what about music??? That was a bit of a myth, circulating in London; a kind of sour grapes about the sudden commercial success of his factory paintings. In fact he was a highly trained artist and had been exhibiting in Paris for some years before he became well-known in Britain. His decision to use stick-like figures and simple skies was a conscious one. Interestingly, as soon as the factory landscapes became known, he stopped doing thema nd changed his style. Yes. They're amazing, and it's fascinaing to see how they changed over the decades. His self-portraits show he was a very complex character, tortured inside and like many artists a bit of a loner, even very self-consciously so. In life as well as art, he was an outsider looking in. But although he went to art classes, it was only part-time and he kept his very mundane day job until he was 65. He certainly started out studying part time, then won a place to study (I think full time though am not sure) under a well-known French Impressionist. As I recall he studied for the best part of 30 years. When he finally retired as a rent collector, many people who knew him and many in the art world were surprised he had a job. His work took him (on foot and by public transport - he never drove) all across Greater Manchester, somewhere he found great beauty in the built environment and in people's family lives. Something he never had. He made a fortune over the years, and gave most of it away. I suspect he paid the rent for poor families he came across in his job. He was far more at home in the Parisian art world than that of London, where less commercially successful artists were jealous of him and rather patronising due to his background, accent and perceived provincial mores. Grandma Moses is a wonderful example, as is Beryl Cook. I've never been quite happy with the terms primitive art or outsider art for either of them. Of more 'pretentious art', some is of course better than others; it's hard to find better than Barbara Hepworth, Dali or Pollock. Did you know that Pollock's style of "splash painting" is incredibly hard to copy? People have tried knocking them out since his death (Lee Krasner didn't have a perfect catalogue) however copies/forgeries stand out like a sore thumb. The difference between genius and fraud maybe. It's quite interesting that in the 15 minute video mentioned at the outset of this thread, there are numerous headlines from various newspapers about janitors and cleaning ladies throwing out these artworks by mistaking them for garbage. I suppose they are just ignorant common folk, untrained in the recognition of beauty or the profound, so therefore can be forgiven. I hope the art was biodegradable (for the environments' sake). What I'll do is take some screencaps of the masterpieces in the video and post them when I get the chance. You're right about that. Primitive suggests a kind of crudeness or limitation and Beryl Cook's work is both technically highly accomplished and captures the mood perfectly. Grandma Moses was closer to William Morris or Erte than cave painters - she was a real artist, gifted in all areas, textiles, embroidery, the whole gamut and she could paint in a variety of styles. Some of her paintings have an almost Gainsborough quality about them, especially her treatment of trees. Some remind me of Paolo Uccello. They're simply beautiful. Have you seen the work of her great grandson? It's a real homage to his granny :)) Not quite in the same league, doesn't have the freshness and lightness of touch but has charm nonetheless. One of the big differences though is that Grandma Moses was painting her own narrative, her life story in a sense, things she experienced, her contemporary world, a social history, whereas her great-grandson is painting a version of that. He writes about his paintings as if they're contemporary but you won't see a car in any of them - they do have cars in Moses County nowadays I believe :)) If I were being culturally snobbish about it, I would classify him more as an illustrator than an 'artist'. "Primitive" or "Native" and abstract are scarcely one and the same. I'm not sure anyone suggested they are. Though there's no reason there can't be an overlap; and this is part of the point; all humanity is intellectually capable of abstraction and of creating art for art's sake. I will certainly have a look today. f I were being culturally snobbish about it, I would classify him more as an illustrator than an 'artist'. What and where the differences are between craft and art (and the extent to which it exists) have got a heck of a lot of people PhDs. Personally I feel it's a continuum where a point occurs beyond which there is an intention to evoke an emotional effect from the observer and/or user. Indeed Grandma Moses was "modern" in chronology, but "traditional" in her purely representational, folkartsy imagry! Yes, and much more than just the style, her works had a kind of genius. What do you think of this one? It's by someone who was certainly an illustrator. Is it just an illustration, is it a work of art, or is it both? 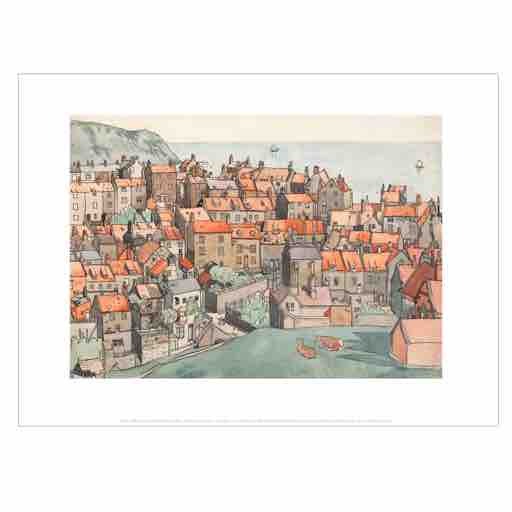 I've got a print of this on my living room wall; it's by Albert Wainwright and is of Robin Hood's Bay, c. 1930. This is fun! Work of art definitely. Now, let me consider why that was my immediate reaction............it's hard to say. The first thing that strikes me is the use of colour, almost monochromatic, there's something very sparing about the rendering and yet it captures the spirit of the place so well, which is really what art is about, capturing the soul of the subject be it a place, a person or an object. I love the way sunlight is suggested so subtly suggested in the painting. You raise an interesting point though Jon. What's the difference between an 'illustration' and a work of art? Because I've always been a great fan of commercial illustration from fashion design through to book covers and advertising and it is now actually a lost art. Incidentally I was watching an Antiques Roadshow on You Tube recently and there was a wonderful painting from the 1950s of a London fishmongers. It was apparently painted by a commercial artist of those days. Wonderful piece of social history. But 'to return to our muttons', as the French would say, art or illustration, what is that tiny ingredient that makes the difference?? Perhaps it's that sense of connection to the subject and yet Sargent did a rather good job even on the ones he didn't like! There though remains a far deeper and more important distinction at work here between "art" vs. "product"! Andy Warhol I consider product, not art. What's the difference between an 'illustration' and a work of art? The latter exists to have an effect on the emotions of those who engage with it as art. Negotiating an illustration can also have an effect on the empotion. The creator's intent is key here. Have you ever wondered if Modern Art is a product of un-intelligible insanity or is intentionally produced to degrade the human spirit so it is left hungry and hopeless. Since the 1960s Western societies have become increasingly less religious and less homogenous while increasingly more feminized and more atomized. This is why artist recognition is ever more determined by affirmative action type of criteria rather than genuine artistic talent. This is also why the value of an artwork is guaged by the preponderance of emotional feelings it provokes rather than having to satisfy the expectations of a critical eye cast upon it. Art value today is derived simply from the reaction it can create. Works could be created to uplift but repulsion and the perverse celebration of debauchery is stronger and more memorable. Success today is determined not by any particular skill (or in most cases lack thereof) but by the mere fact that more can be derived out of a piece of art emotionally than any time and talent that actually went into creating it physically. Also, an artworks' monetary value (with headline grabbing amounts reaching into the hundreds of millions of dollars) only reflects what collectors place it at rather than the public at large. Art collectors typically have very little in common with the public at large. Multi-million dollar amounts would only be problematic if public funds were used to buy such works and display them in public galleries or museums when there is no public interest in them. Collectors and historians also attach more to a work of art than what even the artist may have been thinking or feeling at the time. Art reflects eras. In the case of Basquiat and others from his libertine generation it was a statement of the complete rejection of traditional European styles of artistry. Some today would still regard Basquiat as anti-establishment. 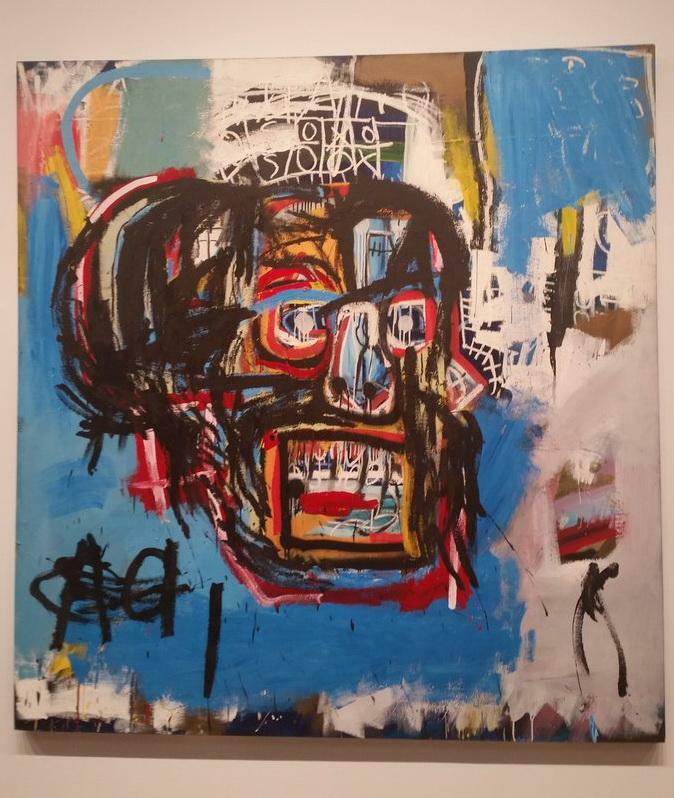 But since America was the leading post-war economic and military superpower it would be fair to say that Basquiat and his ilk simply created generational milestones for the new status quo at the time. As time goes on, his and his generations' artworks won't simply be regarded as infantile, unskilled and degenerate. They will be seen as examples of American pop culture, of Western mercantilism, and of 60s-era "values". And just like how Basquiat & Co. rejected tradition and convention in their day so too will they be rejected by future generations. So-called "art" has indeed become gimmicky and overly commercial, to say the least:-) To this commentary, I'd of course include cinema. The difference between the art of post-1965 for instance, is that once, painter and/sculptor, photographer were callings, not merely jobs which translated into a safe paycheck! While there certainly is nothing wrong with being more than adequately compensated for one's labors, it does seem though that the world of art on many levels has long since traded in commitment for sheer peace of mind. Perhaps only Frank Lloyd Wright had the true originality that comes solely from genius to demand princely sums for a profession at which a great many others might have starved. Court appointed architects such as Bernini were the lucky ones and Gottfried Semper didn't live all too shabbily either. We've become too self-satisfied, too comfortable for our own good. A difficult balancing act to maneuver at best!